, an excellent writer in the sixteenth century, was born at Veroli, in the Campagna di Roma, and descended of noble and ancient families by both his parents. He was baptised by the name of Anthony, which according to the custom of the times, he altered to the classical form of Aonius. 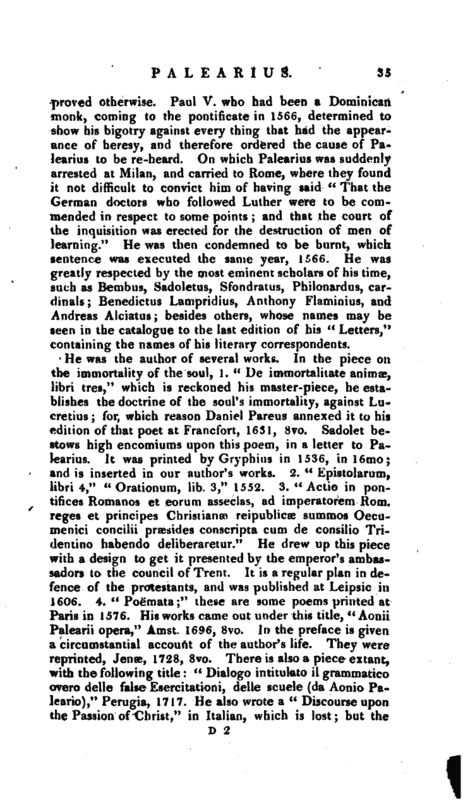 He applied himself early to the Greek and Latin languages, in which he made great progress, and then proceeded to philosophy and divinity. 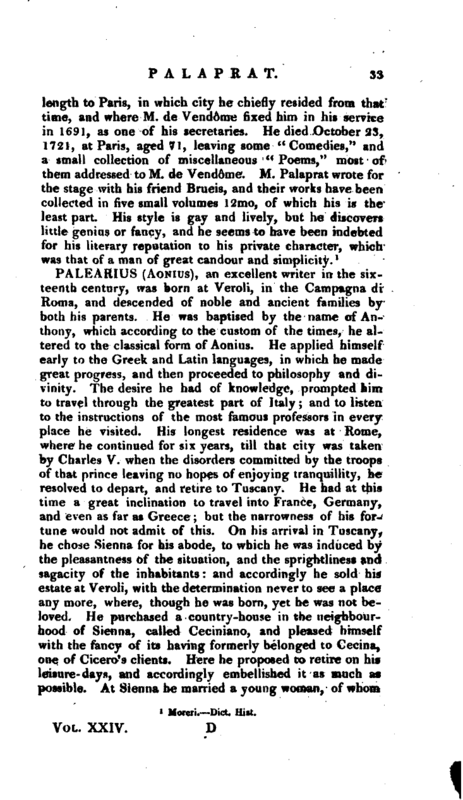 The desire he had of knowledge, prompted him to travel through the greatest part of Italy; and to listen to the instructions of the most famous professors in every place he visited. His longest residence was at Rome, where he continued for six years, till that city was taken by Charles V. when the disorders committed by the troops of that prince leaving no hopes of enjoying tranquillity, he resolved to depart, and retire to Tuscany. He had at this time a great inclination to travel into France, Germany, and even as far as Greece; but the narrowness of his fortune would not admit of this. On his arrival in Tuscany, he chose Sienna for his abode, to which he was induced by the pleasantness of the situation, and the sprightliness and sagacity of the inhabitants: and accordingly he sold his estate at Veroli, with the determination never to see a place any more, where, though he was born, yet he was not beloved. He purchased a country-house in the neighbourhood of Sienna, called Ceciniano, and pleased himself with the fancy of its having formerly belonged to Cecina, one of Cicero’s clients. Here he proposed to retire on his leisure- days, and accordingly embellished it as much as. possible. At Sienna he married ajoung woman, of whom | he was passionately fond, and who brought him four children, two boys and two girls. He was also professor of polite letters, and had a great number of pupils. 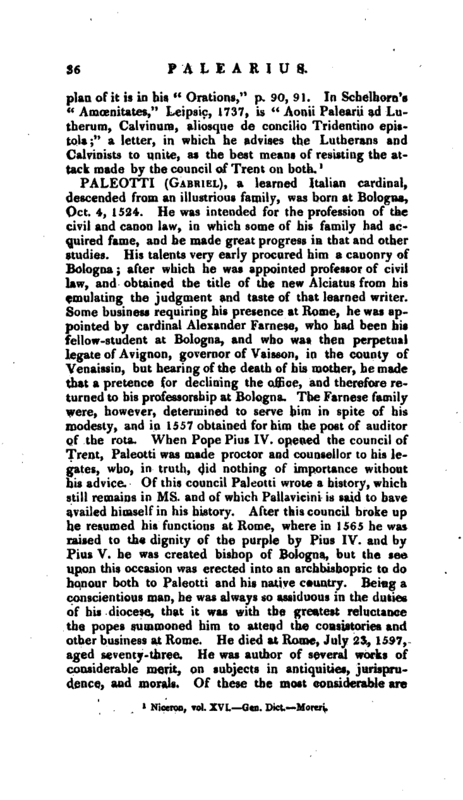 But his career was disturbed by a quarrel he had with one of his colleagues, who was enraged to see his own reputation eclipsed by the superior lustre of Palearius. 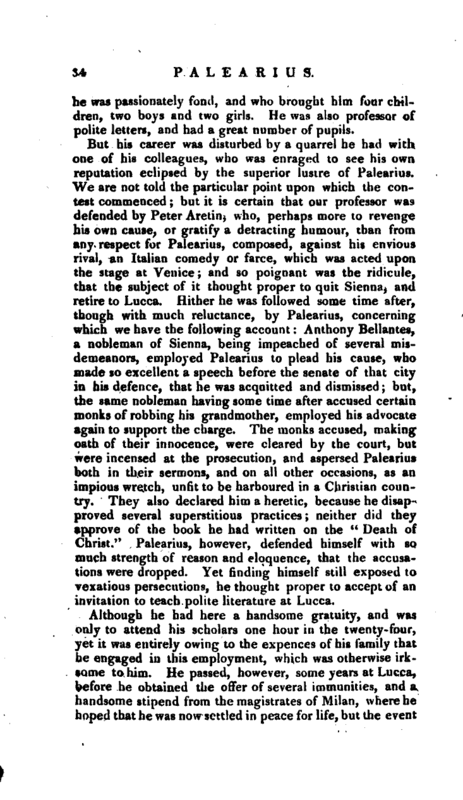 We are not told the particular point upon which the contest commenced; but it is certain that our professor was defended by Peter Aretin, who, perhaps more to revenge his own cause, or gratify a detracting humour, than from any respect for Palearius, composed, against his envious rival, an Italian comedy or farce, which was acted upon the stage at Venice; and so poignant was the ridicule, that the subject of it thought proper to quit Sienna, and retire to Lucca. Hither he was followed some time after, though with much reluctance, by Palearius, concerning which we have the following account: Anthony Bellantes, a nobleman of Sienna, being impeached of several misdemeanors, employed Palearius to plead his cause, who made so excellent a speech before the senate of that city in his defence, that he was acquitted and dismissed; but, the same nobleman having some time after accused certain monks of robbing his grandmother, employed his advocate again to support the charge. The monks accused, making oath of their innocence, were cleared by the court, but were incensed at the prosecution, and aspersed Palearius both in their sermons, and on all other occasions, as an impious wretch, unfit to be harboured in a Christian country. They also declared him a heretic, because he disapproved several superstitious practices; neither did they approve of the book he had written on the “Death of Christ.” Palearius, however, defended himself with so much strength of reason and eloquence, that the accusations were dropped. Yet finding himself still exposed to vexatious persecutions, he thought proper to accept of an invitation to teach polite literature at Lucca. Niceron, vol. XVI.—Gen. Dict. Moreri.